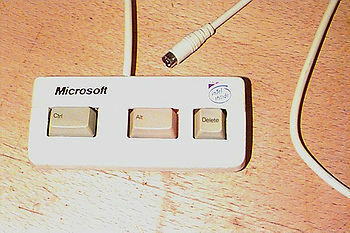 In April 2006, Microsoft released a new keyboard design following the results of a study on Windows users on which actions they needed to perform most often. The results showed, overwhelmingly, that Ctrl-Alt-Delete, was by far the most frequent key combination used, for restarting Windows, followed closely by Delete, for removing files, viruses, license agreements, viruses, temporary files, your homework, school, earth, the universe, and Windows. The keyboard is available in beige or black. Unfortunately, the black version was a flop as Microsoft forgot that they would have to change the ink color for the key labels as well. Thus, the labels being black on black, no one knew which keys were which. It is available with a PS/2 connector, USB, or wireless Bluetooth. The Bluetooth versions proved unpopular because of a problem with the circuitry. This made the transmitter power insanely high and could cause all Windows computers up to a 2 miles (3.2 km) radius to restart. Unless Windows had actually crashed, in which case the Bluetooth drivers would "not respond". Users also found that during heavy use, the battery life was a little less then 2 hours (0.0833 days); completely inadequate in a business environment. The USB version faired a little better, as fully-working USB support only became available with Windows Vista. Thus the only actual working design on the market is the beige PS/2 one, pictured above. The study also showed that when Ctrl-Alt-Delete was used it would be pressed many times in rapid succession in order to coax the computer into paying attention to it. Microsoft, realizing that they would never be able to release a software patch in Windows to fix this flaw which anyone would actually download (or that wouldn't just introduce new security holes), turned to a hardware-based solution. The fix involved fitting a miniature Intel processor inside the keyboard which sends the Ctrl-Alt-Delete keystroke repeatedly every 200 milliseconds (approx 6.342 × 10-9 years) when the user holds the keys down. The new Microsoft Keyboard is fully compatible with StickyKeys on supported platforms, enabling users to restart their computer by pressing, Ctrl, Alt, & Delete separately if pressing them all at once is difficult. When asked why they didn't simply release a keyboard with Ctrl-Alt-Delete on one key, Microsoft replied, "We didn't think of that to be honest, yo. It's a good idea though." 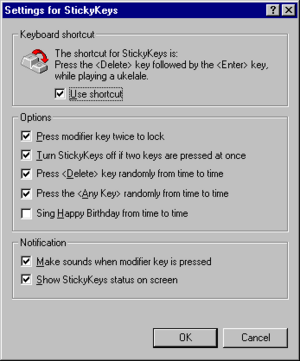 A little over 2 hours (or exactly 7218 seconds) after the release of the keyboard, the GNU Free Software Movement had released a small patch compatible with all versions of Windows from 1.0 to Vista, which recognizes the new keyboard and simulates a Ctrl-Alt-Delete keystroke when just Ctrl is pressed, thus boosting user productivity by an estimated 128%. Linux does not require the use of the Ctrl-Alt-Delete keystroke. It rarely encounters problems, and if it does, it has better ways of closing a problem program or restarting the operating system. However, Linux kernel versions 2.6.2 or greater have built in support for the keyboard, and can use its built-in CPU as extra processing power for the main system. The keys can be configured to play games, do cool things with Beryl Compiz etc., or whatever you want. The default key options link to a Windows help website in large, friendly letters, offering advice on how to convert Windows systems to Linux and get over your Windows addiction. Following the product's release, Microsoft fell under heavy criticism for trying to push the keyboard to users through Windows Update. On computers with an attached matter replicator, the keyboard is downloaded in the background and materialized on the desk near the mouse. The service was also designed to automatically charge the user's credit card for its payment. However, fortunately, the credit card payment system rarely worked. After sending its users over 700,000 free keyboards costing $4 billion, Microsoft discontinued the service. It is also apparent that the internal processor tends to overheat under heavy use. Microsoft is awaiting the outcome of a court case filed collectively by almost 1.4 million Windows users with burnt fingers after just the first month of the keyboard's release. According to rumors, the keyboard is also prone to its own viruses (not surprising really). Connectivity: PS/2, USB, or Bluetooth. Dimensions: 112mm × 46mm × 25mm. Weight: 1.3 kg (2.87 lb) - due to processor. The Bluetooth version weighs an additional 0.5 kg (1.1 lb) due to the battery. OS support: All PC's and compatible with appropriate drivers. MTBF: Relatively short if using Microsoft Windows. Proud producers of the Xbox 360. All you need to do is buy your preferred version, determine if your system is 32-bit or 64-bit, save any files you need from another operating system, format your hard disk, enter a Windows product key, connect to a network, and complete. phone your local Microsoft Customer Representative, write down a very long set of numbers, type it all in, get an error message, phone our Customer Representative again, adjust a few things, get another very long set of numbers, type it all in again, install a few drivers, activate Windows again, lather, rinse and repeat. This copy of Microsoft Windows is not activated. This page was last edited on 23 April 2018, at 02:37.